12.5" RCOS @ ~f/9 (2880 mm fl) 0.643 arcsec / pixel. The Zoomify image scale is 0.94 to 2.35 arcsec / pixel. 09/29/2009 to 10/23/2009 Chino Valley, AZ... with CCDAutoPilot3 & CCDSoft. Noel Carboni's StarSpikes Pro was used to restore and sharpen the normal spider defraction spikes. 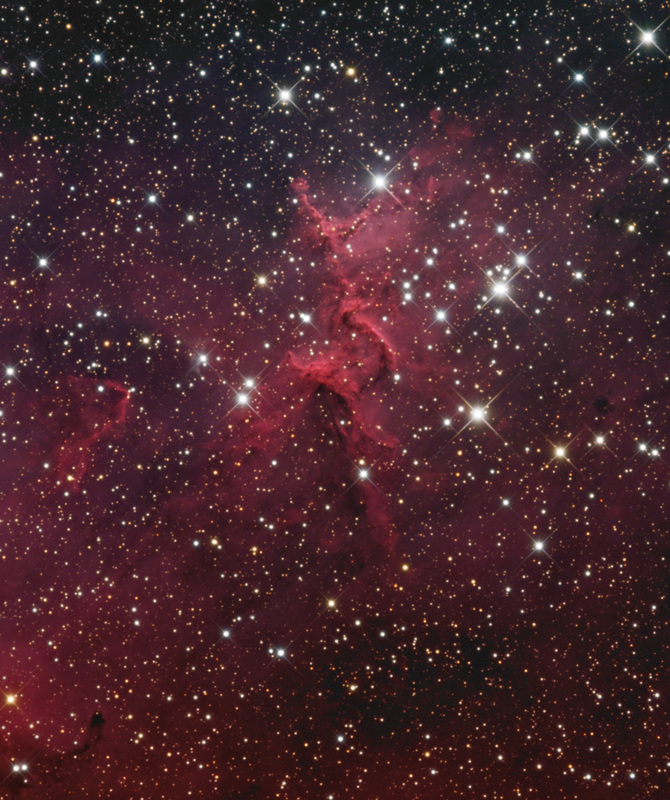 Located at the center of its parent emission nebula, IC 1805 (The Heart nebula), is the star cluster Melotte 15. Stellar winds and radiation, from the young hot massive stars in the cluster, form the nebula gasses into this beautiful tree like sculpture. IC 1805 is about 7,500 light years away, toward the constellation Cassiopeia. It is illuminated by Melotte 15, which is located about 50 light years closer.